It is 10:34 pm, on some random weekday in 1997. I just got home from work at Sam Goody to my apartment in Ballwin, MO. My roommate Jeremiah, who works as a server at Chevy’s Mexican Restaurant in Crestwood Plaza is sitting on his bed reading as I walk past his room. “Hey, whatcha doing tomorrow?” he yells. “Nothing yet, I have the day off.” I say as I stick my head through the open door. We would be packed up and on the road by eleven that night, and would get to wherever we were going by probably twelve thirty. Last minute and completely spontaneous. All you really needed was a lighter, a pack of hotdogs, some water, and a sleeping bag. Extra socks were a luxury. 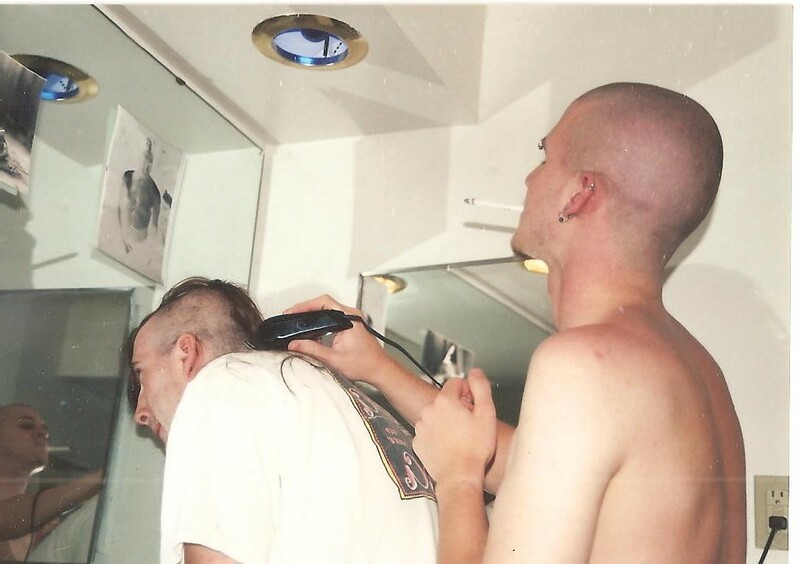 Piercings, cigarette hangin’ out of my mouth, shavin’ my buddy’s head? Look at me expressing myself. This was the typical level of planning that went into my excursions to the woods in my late teens. I had moved out of my parents house when I was 18, and even before that I had already been going out hiking and camping whenever I could, thanks to the freedom afforded by a driver’s license and a distinct lack of responsibility. I had met Jeremiah while I worked at Exhilarama, the arcade in Crestwood Plaza. He was a year older, had a blue Ford Tempo, and was more of wanderer amongst the trees than I was. 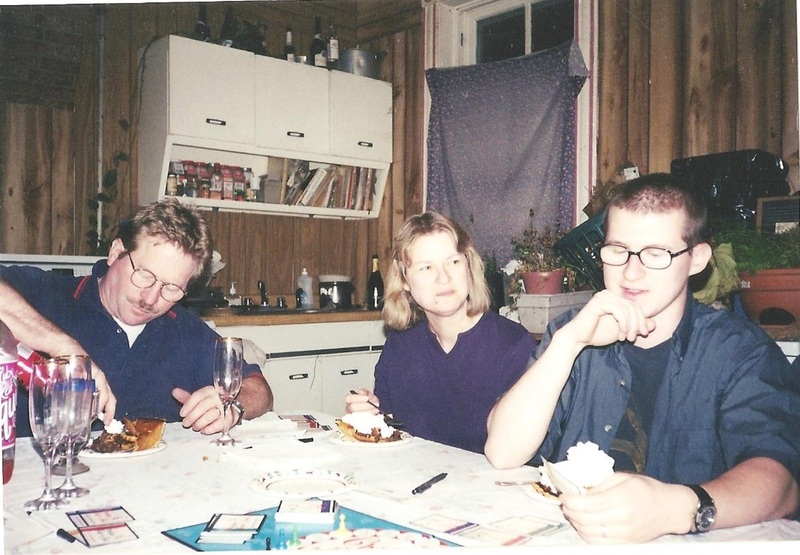 As I was homeschooled and he had finished high school, we both worked Monday and Friday mornings, with the middle of the week free for getting into trouble. That usually meant hiking through the forest somewhere, half the time off the trail. I can remember warm mornings, tearing down highway 44 on our days off, listening to Ministry and having no idea where we were headed. Sometimes we had a destination in mind, but sometimes we would just drive until we found something new. I remember nights sitting on this bluff, overlooking the Big Creek, listening to Skinny Puppy on my cassette walkman, watching the stars. 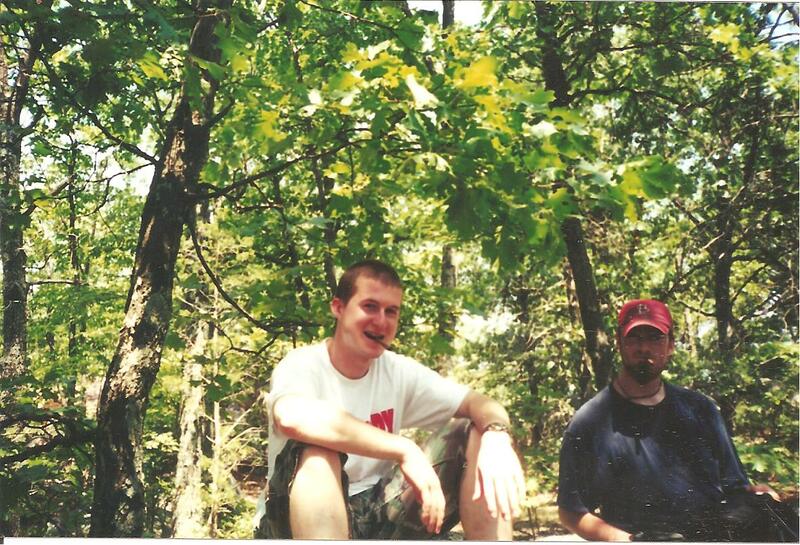 One of our frequent destinations were the hiking shelters on Mudlick Mountain in Sam A. Baker State Park. We probably went there more than anywhere else, and it was one of my favorite places to be in the woods. Driving south on 67, listening to Frank Zappa and conversing about how we hoped “the girls were gonna show up”. The first time down there for me was April of 1996, right before my 18th birthday. We went down on a Friday morning and stayed up there until Sunday. Gathering wood from the hill above the shelter and exploring the forest on the mountain, as we waited for friends to show up later that evening. We got to know that mountain pretty well and it was a regular thing to hike up to the firetower at the top, long after the sun went down, to hop the fence and climb the stairs to check out the view late at night with the wind whipping through us. And then there was the prospect of “your firewood is limited to how much you can gather”. If you’ve spent time with me around a camp fire, and the conversation has ever turned to Sam A. Baker, then you have very likely heard me tell of the Thursday we stayed at the shelter gathering wood all day long until we had a stack 5 feet high. There weren’t any more logs left to drag down the hill. If time travel existed, I would go back in time to punch myself right in the face at least once. It was because of Jeremiah that I became familiar with the floating capital of the world, Eminence, MO. 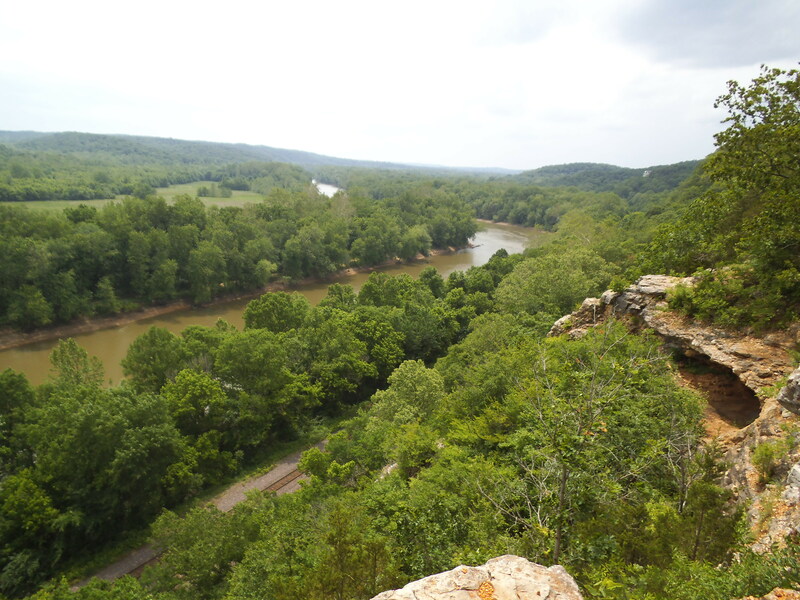 It is home to the Jacks Fork River and the Current River, which jointly make up the Ozark National Scenic Riverways. They are two of the most pleasant and beautiful waterways in America, and his mom had been bringing him on trips there since he was little. I have no recollection of the name of the outfitter or the section of river, but on one trip there we floated over the course of three days a 52 mile stretch. It was unreal, floating half the day and then camping on the beach at night. Isolation. Independence. Freedom. I can’t think about it without wishing I was on the river right now. And then there is the Ozark Trail. At one time in my life, we were determined to eventually hike the whole thing, but the only section that I have actually completed was when he and I hiked the Eleven Point Section. This was a story in itself, but the summary would start along the lines of: “Two young adventurers, completely unprepared for the wilderness ahead…” It was an undertaking of inexperience and over-packing, and I will never forget the valuable lessons from that trip. 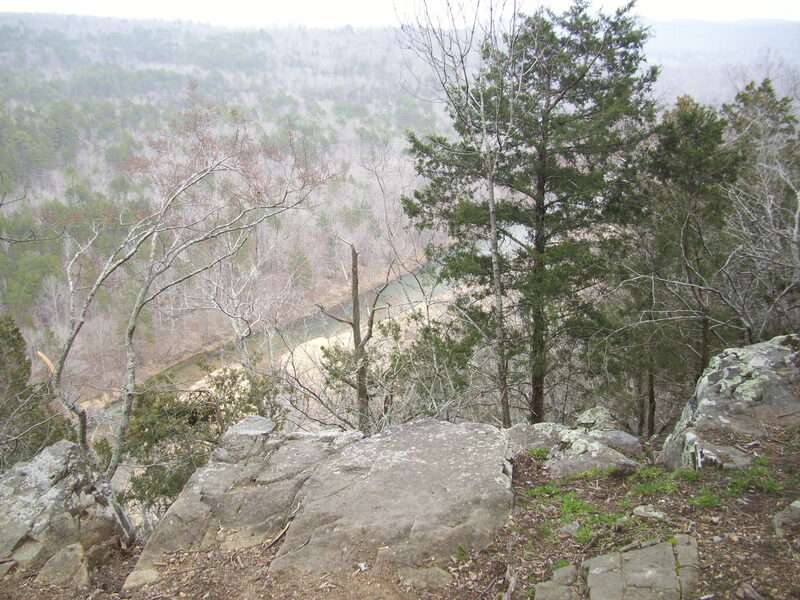 It is still on my list to hike the rest of the Ozark Trail one day. My parents and I, at our home on Oregon Ave. These were a few of the more momentous trips. 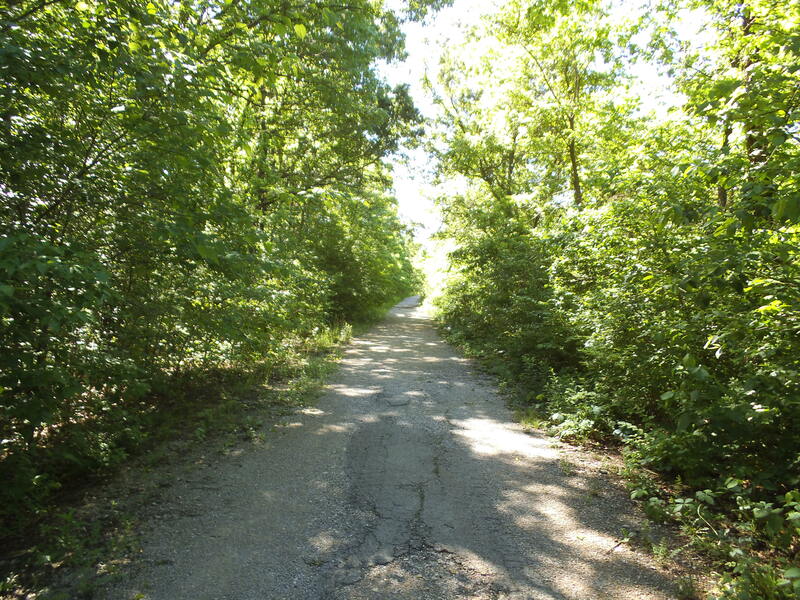 For the most part however, we would usually just drive to some trailhead out in west St. Louis County, probably adjacent to Greensfelder, and just hike down a hill in the evening to a creek at the bottom, find a flat spot and set up camp for the night. We weren’t following all the rules, but I don’t know that we should have. We were young and irresponsible and I think everyone, including my own kids, has to go through a time in their lives like this, and it is usually the teenage years. Pushing the boundaries of freedom and going against rules like “Operating Hours”. We came out of it pretty unscathed and more weathered and experienced. There were the occasional bottles of booze, but for the most part we kept it pretty clean, usually from the fact that we didn’t have anyone to buy it for us. We would head out into the woods with maybe a bottle of cheap vodka in one of our packs, to be passed between us as we sat in front of the fire before sleep, and I think the inability for excess probably benefited us. We weren’t offered drunken opportunities to make stupid decisions out in the wilderness that could have gotten us hurt. Plus, in our eyes at the time, a case of beer was just extra weight we didn’t want to carry. The beer and pot would always show up when more people were involved. 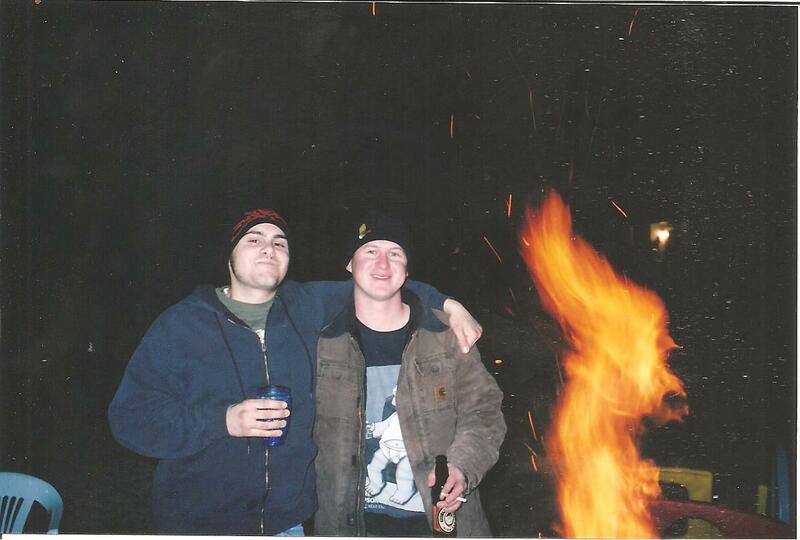 I remember a night out at Babler State Park when I was probably 20 that could have turned out worse than it did. My girlfriend at the time and some of her friends were staying out there and I was joining them after I got off of work that night. They had set up camp at the end of the easternmost section of the campground, and by the time I got there they were all well on their way to having a good time. I cracked a beer and took a swig of whatever bottle was the being passed around, and proceeded to turn the music up louder. With no idea what the time was, we were eventually visited by the park ranger. He asked us for our IDs and took a look at the cans of beer littered around. “You kids know I ought to call the police in here to haul you away for “minors in possession”, don’t you?” None of us made any real statements. We were just a chorus of mumble. He told us to open the cooler and then had us pour out all the beer into the leaf litter on the edge of the site. He then gave us our IDs back and informed us that if he has to visit again, we would be arrested. After he left, we pulled the hidden bottles of booze back out that we had stashed, and refrained from turning the radio back on. Yeah, those days were a long time ago. Nowadays I would be the one calling the ranger on the obnoxious punks at this point. If you’re going to be in a campground, it is best to observe all the rules, respect your neighbors, and just NOT turn the radio up when you’re drinking while underage. I would like to think that compared to other kids I was relatively good, but I think an important distinction is that I just never really got caught. Probably because I was in the middle of nowhere at the time and I was tired from bushwacking through the forest for half of the day, so the desire for unruly drunken behavior was overpowered by my preference to just sit and mellow out. I still fondly remember the shimmer of the street lights late one night when we were sitting in the Steak ‘n Shake at Elm and Watson Rd, drinking coffee and discussing the book “Into the Wild”. 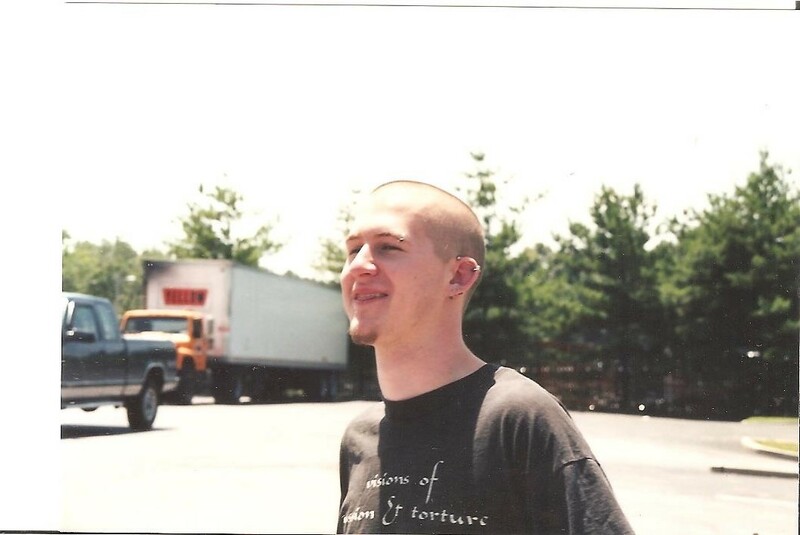 I was probably 17, and the handful of us there had all read it and we were convinced that maybe sometime in the next month, we were going to each leave our homes (except for Shaun) and spend the next few years walking across America, eating rice and sleeping in the bushes on the side of the road. As much of a life changing adventure as that would have been for my scrawny, introverted, inexperienced self, I don’t regret not doing it. That was almost 18 years ago now, and the path I was currently traveling on was the right one, for in about five years it would change my life in a rather dynamic way. Events not too far down the trail were going to force me to grow up at a pace I was not yet familiar with. I’m loving this series, it must be because you’re a Zappa fan! I’m glad you’re enjoying it. It has been fun trying to remember the times I had, and stomach turning to look at the few old pictures I have of myself as a teenager. I am not as much of a Frank Zappa fan as my buddy Jeremiah is, but I have always enjoyed his music. It became a tradition to listen to “Billy the Mountain” every time we drove down to Sam A. Baker. It is a shame that we lost him, especially in these dynamically chaotic times, among other heroes that are gone from us.